Wink, smile and aviator glasses: pure Jimenez. Welcome to the 2015 Golf Preview, where I’ll take a look at selected golfers and examine what to expect over the next twelve months. Today, we look at Miguel Angel Jimenez. Miguel Angel Jimenez turned pro when he was 18 years old, which really isn’t anything significant on it’s own. Most players, especially the really good ones, turn pro around the age of 18, but Jimenez of course turned 18 in January of 1982. Jimenez has had a tremendous amount of success playing mostly in Europe over his career, but there’s an argument to be made that 32 years after becoming a professional, he is actually better than ever. After a strong finish at the Nedbank last week, Jimenez climbed to 39th in the Official World Golf Rankings. After first cracking the top-50 in the world back in 1994, Jimenez has alternated between good and bad play for much of the 90’s before falling all the way to 303rd in the world in July of 2003, a spot that is currently occupied by South African Jake Roos, a player who had to win six times in the last three years to get to that number. Slowly though, Jimenez has gotten it back together, staying the top 100 every week since 2004, and spending most of that time inside the top 40. He’s won on the European Tour in each of the last three seasons, continually breaking his own record as the oldest player to win in Europe, and he was finally able to capture his own national title in 2014, defeating Richard Green and Thomas Pieters at the Open de Espana. The month prior to that emotional victory, he placed 4th at the Masters and then went on to win in his Champions Tour debut at the Greater Gwinnett Championship. Even as he approaches age 51, the weirdly nimble Jimenez has proven that he can stick with the world’s best in any age group. 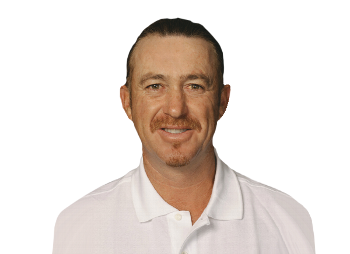 This one isn’t an all-timer (don’t worry, we’ll get to those), but Jimenez hasn’t looked like this since the soul patch was inexplicably a thing. Still though, at least you can recognize who he is. Miguel desperately wants this to go right. It didn’t. Jimenez dances in the fairway after a holeout at the Lyoness Open. Throw in the fact that his swing is kinda weird looking, which I love, and that he’s still pretty damn good and you really don’t need any other reasons to watch the guy play. We could all stand to be a little more like Miguel Angel Jimenez. I realize that I just showed off five GIFs of Jimenez, but I had already decided on the format of these posts, so you’re going to have to look at one more. Lastly, the legend that is Miguel Angel Jimenez warming up before his round on Sunday. Is there a more representative GIF out there of the Mechanic? Jimenez, warming up with cigar in mouth, and letting out that puff of smoke at the seemingly ideal moment? This is Miguel in a nutshell. How much longer can Miguel Angel Jimenez compete at the highest level? As mentioned above, Jimenez turns 51 in January. Only six players have ever won on the PGA Tour past the age of 50, and with how little Jimenez plays in North America, I doubt that he’s going to be the 7th unless he pulls something off in a major or a WGC event, and he’s already the oldest ever winner on the European Tour. He’s clearly playing at an insanely good level regardless of age. I mean, before taking an assistant captain’s spot under Paul McGinley at the Ryder Cup, there was a lot of talk around him playing at Gleneagles for Europe, and he probably wasn’t far off. At a certain point though, you do have to wonder how much is left in the tank for a guy who has been doing this for over 30 years. Selfishly, I hope this never ends. Golf is simply better with Miguel Angel Jimenez involved.